A selection of glacier cave photographs from several glaciers including Castner, Canwell, Black Rapids, Gakona, Root, and Augustana. Photographing these so-called "ice caves" is physically demanding, technically challenging, and sometimes dangerous. Some of the caves I've explored extended for thousands of feet into total darkness. The resulting images are often quite surreal, though I never have enough time to explore all the angles in these ephemeral natural wonders. For tips on photographing ice caves, see my blog post How To Photograph An Ice Cave. If you're interested in visiting Castner, Canwell, or Black Rapids Glacier, see here for tour information. A very long tunnel beneath the blue ice of Black Rapids Glacier. Light penetrates through the ceiling of this narrow Gakona Glacier cave. Exploring a Castner Glacier ice cave with headlamps. 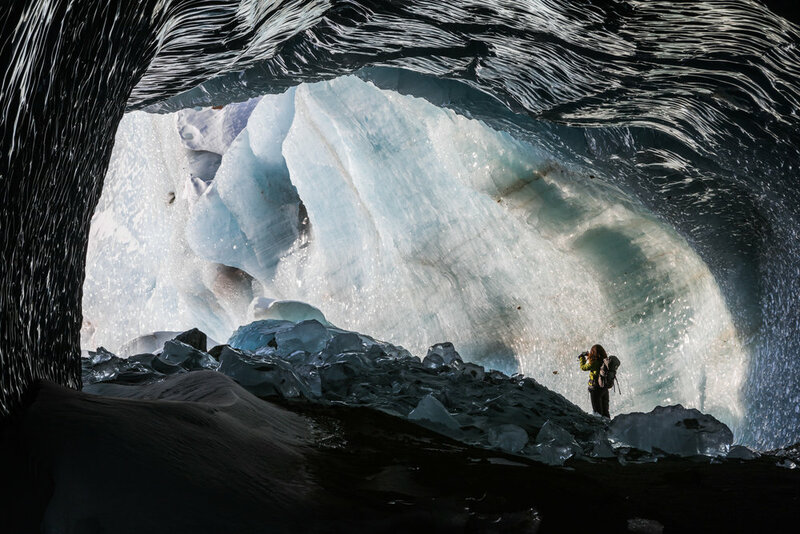 A man examines the dark interior of an Augustana Glacier cave. 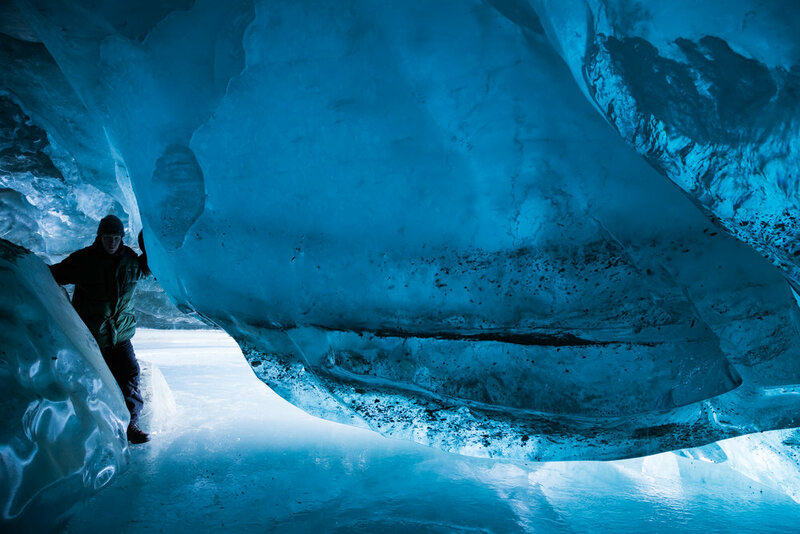 A man is dwarfed inside a cavernous ice cave within Canwell Glacier in the Alaska Range. The floor, walls, and ceiling of this Canwell Glacier cave were made completely of ice. Water cascades over rocks on the floor of a cave beneath the ice of Root Glacier in Wrangell-St. Elias National Park. Looking out the opening of a long ice tunnel within Canwell Glacier. Late afternoon sunshine illuminates an ice cave beneath Root Glacier in Wrangell-St. Elias National Park. Standing in a long tunnel carved into the ice of Black Rapids Glacier by a meltwater stream. Details in the ice of a Canwell Glacier cave. Exploring a giant tunnel in the moraine of Black Rapids Glacier. Light from a headlamp reflects on the floor of a cavernous Augustana Glacier cave. Examining the ice of a translucent tunnel on the moraine of Black Rapids Glacier.